DARK TOWER GUNSLINGER : LAST SHOTS - First Time In Hardcover! Plotted by Robin Furth (with Stephen King), script format by Peter David. FREE Signed Illustrated book plate by Robin Furth (advance orders only). Illustrated by Richard Isonove and Dean White. This is the first time this edition, LAST SHOTS, has been released in hardcover! OVERVIEW: Now, in the graphic novel series adaptation Stephen King’s The Dark Tower: The Gunslinger, originally published by Marvel Comics in single-issue form and creatively overseen by Stephen King himself, the full story of Roland’s troubled past and ongoing saga is revealed. Sumptuously drawn by Richard Isanove, Sean Phillips, Luke Ross, and Michael Lark, plotted by longtime Stephen King expert Robin Furth, and scripted by New York Times bestselling author Peter David, The Gunslinger adaptation is an extraordinary and terrifying journey—ultimately serving as the perfect introduction for new readers to Stephen King’s modern literary classic The Dark Tower, while giving longtime fans thrilling adventures transformed from his blockbuster novels. 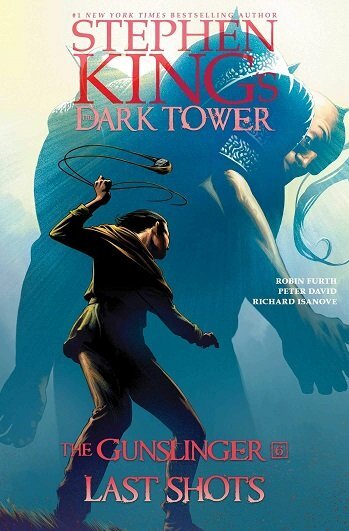 Two incredible tales on the road to the Dark Tower! Young Sheemie possesses the awesome power to shatter the very Beams of the Dark Tower—the fulcrum of existence itself. But Sheemie doesn’t want to destroy reality; trapped in the prison of Devar-Toi, all he wants is for his friends to rescue him. Roland is coming for him even now, but Sheemie must evade hideous guards and the monstrous Great Old Ones while he waits…Traveling through the Desatoya Mountains, Roland comes across a haunted camp. There he relives one of his past adventures, in which he and his ka-tet were trapped by supernatural enemies. How will the young gunslinger survive the sinister assault? And how does it relate to his current guest. 2019 Gallery 13 Hardcover. New. This product will be in stock on 07/02/2019.